Last week I picked up a cute little girls' two-piece outfit at Walmart for $7. 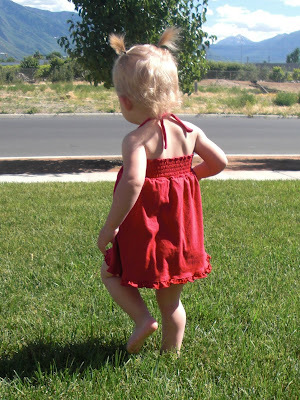 It was size 8 -- obviously way too big for JellyBean -- but I had some refashioning in mind!! The skirt had built-in shorts -- and I immediately had an idea for what to do with them! I cut them away from the skirt as close to the seam as possible. I sewed another line of stitching around the hem of the shorts. I was careful to make the distance between the original hem's stitching line and my new stitching line just the width of a safety pin. On the inside, right next to the inseam, I snipped a little hole in between lines of stitching, then used a safety pin to thread 1/4" elastic through. I folded down the top raw edge of the shorts and sewed to create a casing. I used 3/4" elastic, although if I'd had 1/2" elastic on hand I would have used it instead! Ta-Da!! Super quick little bloomers with cutie little ruffly leg openings! I then put the skirt on JellyBean, up around her chest, and measured how much I would need to take out to make it into a little top. I sewed, then cut away the excess. I used the scrap to create two little straps -- which ended up being the perfect length! I marked them for placement and sewed them in place on the inside of the top. Ta-Da!! An adorable little sunsuit! Super quick and easy, and done in one sitting -- supreme satisfaction! I can tell she feels very cute in it by the way she walks! You are an amazing refashioner! Its very cute. wow! cute overload, good job! Super cute; I love it! Turned out so well! What a great refashion!!! wow care, that is so so cool! I love it. She looks so adorable and summery! That is adorable! Great idea!! I think now I must start checking out bargains in the older kids departments as well. Thanks for the idea! She looks SUPER CUTE!!! And I like that it's an easy outfit to get on and off :) Those bloomers are adorable. So sweet! Love the revamp. 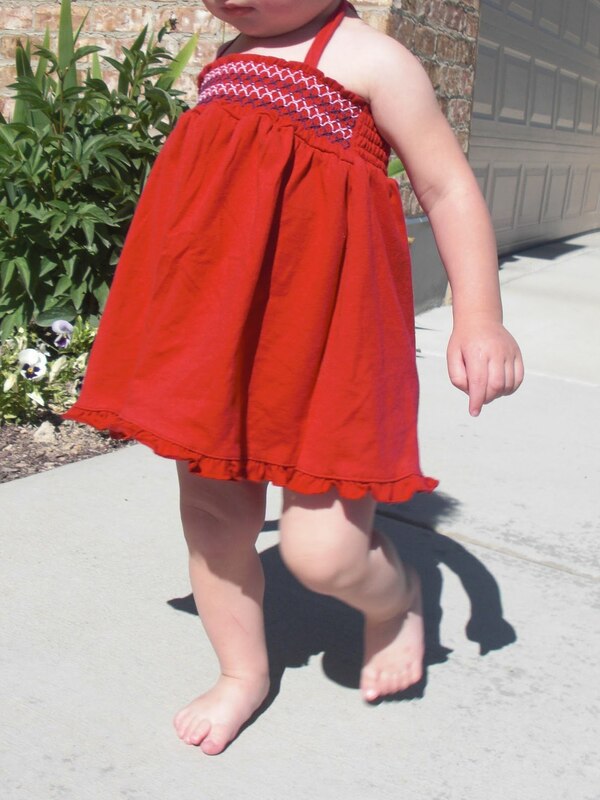 I wish I could romp around in bloomer and halter dress. Such a cutie in her new summer re-fashioned outfit!